The Navy is part of the New Zealand Defence Force – a Force for New Zealand – and works closely with the Army and the Air Force as well as other Government and non-government agencies including the Ministry of Primary Industries, New Zealand Police and Customs. The Navy’s readiness to deploy provides the Government with an important tool to respond quickly to emergency situations around New Zealand or overseas. New Zealand’s economic prosperity is reliant on a stable political environment and safe maritime trade routes. Nearly all of our country’s exports (99% by weight) and most of our imports are transported by sea. Threats to shipping, such as piracy or blockade, have affected our economy in the past and could do so again. New Zealand is a valued regional security partner and our Navy works collaboratively with other Navies to protect our region’s valuable maritime trade routes. In recent years Navy ships and people have deployed to the Arabian Gulf and Horn of Africa where we contribute to international efforts to protect trade routes and prevent piracy and terrorism. Navy ships and people protect our countries interests with regular border and fisheries patrols, search and rescue operations, as well as supporting the Police, Civil Defence and the Department of Conservation. Four inshore patrol vessels work around the New Zealand coast and two offshore vessels do similar work in the Southern Ocean and Pacific. The Navy is ready and capable of responding to natural disasters at home and abroad. 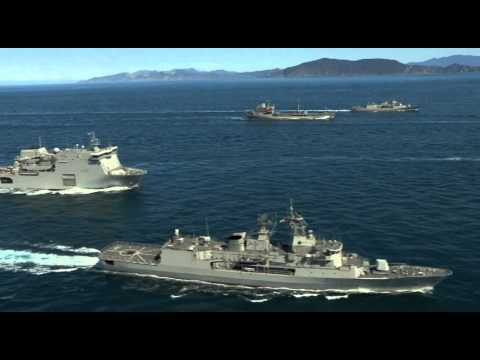 Navy ships and people were among the first responders to the devastating Christchurch earthquake in February 2011. Navy ships are ready to undertake search and rescue missions and are active in the South Pacific where ships of the Naval Patrol Force regularly undertake fisheries patrols, visit ports and contribute to humanitarian missions such as cyclone relief or transporting supplies to remote islands. Navy personnel take part in peacekeeping operations around the world. Navy ships and people have recently been deployed to Timore-Leste’, Solomon Islands, Sudan, the Middle-East, South Korea and Afghanistan. Navy maintains a modern, deployable specialist underwater operational and survey capability. The Operational Dive Team and Littoral Warfare Support Force are capable of military and civilian tasks, including search and recovery, and deploy to incidents within New Zealand and overseas. The Navy’s values are Courage, Commitment and Comradeship. Could you live by them? The Navy has around 2,300 uniformed personnel supported by several hundred civilian NZDF staff. The Navy’s values are Courage, Commitment and Comradeship. Navy personnel are highly trained in military, maritime and technical skills and during their careers will spend time on board ships around New Zealand and overseas and may be posted to shore-based roles at home or around the world. Most Navy personnel are based at Devonport, Auckland where the shore base HMNZS PHILOMEL is responsible for administration, supply and training support to the fleet. The RNZN fleet is made up of 9 modern, versatile ships that undertake a full range of maritime military tasks from combat and peacekeeping operations to border patrol and support for civil agencies. Combat Force: The Combat Force is comprised of two ANZAC class frigates HMNZS TE KAHA and HMNZS TE MANA. The Navy operates Kaman SH2G helicopters from the frigates. Support Force: The Support Force is comprised of a fleet replenishment tanker HMNZS ENDEAVOUR and an amphibious and military sealift vessel HMNZS CANTERBURY. Littoral Warfare Support Force: Our Navy Diver unit, Hydrographer base and Mine Counter Measures Team are all located within the shore-based HMNZS MATATAUA. Most of the technology we use can be found on our ships and helicopters. We have 9 ships, they are designed to perform the different missions that we’re tasked with, such as combat, patrol, diving support and hydrographic surveys. In a combat scenario, we have a wide variety of equipment to draw upon. It ranges from weapons systems such as guns, missiles and depth charges to the electronic tracking equipment we use to identify, monitor and listen to other vessels at sea. The engine rooms on our ships can propel us at speed over vast distances. They also help supply the ship by turning dirty seawater into fresh drinking water. We also have extensive hydrographic equipment. We use this to measure and analyse features of the sea, such as currents, waves and what’s happening on the ocean floor. When you’re working on the sea, understanding every aspect of it is essential. Ten ships of the Royal New Zealand Navy perform manoeuvres in the Cook Strait before sailing into Wellington Harbour.